Scroll down to see our Gallery of Rentals. "Excellence In Real Estate Award"
for providing outstanding local Real Estate content. Condominium on Second Floor with Elevator above Marina, 3 Bedrooms, 2 Full Bathrooms, Windows overlook Lake and Park, Boats, Boat Slips and Watersports Equipment Rentals at Marina, Sandy Beach within Walking Distance, Restaurants and Shops within Walking Distance, Gas Fireplace, Central Air, Ceiling Fans, No Pets. 7 Bedrooms, 7 Bathrooms, Modern Kitchen, 5 TVs, 4 Blu-Ray DVD Players, Pool Table, 2 Arcade Games, Ping-Pong Table, Screened Porch Across Front of House, Gas Grill, Firepit, Flat to Waterfront, 6 ft deep at end of Pier, 2 Waverunner Lifts, 6000 lb. 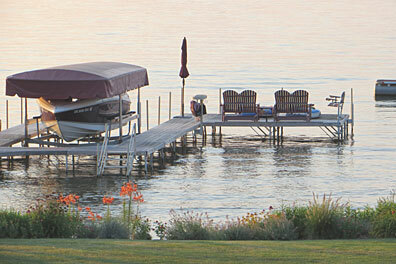 Hydraulic Boat Lift will hold a Deep-V Hull or Pontoon, Limited to One Pet under 40 lbs. ($100 charge), Charge for One Pet over 40 lbs. is Negotiable. 5 Bedrooms, 4 Bathrooms, Central Air, State-of-the-Art Kitchen, Home Theater with 110" Screen and Streaming Internet, 12 Person Steam Shower and Spa, 900+sq.ft Game Room with Fort Maze System, PingPong, Foosball, Hockey Table, Pool Table, Books and Games; Glass/Screened Porch, Large Deck with Furniture Faces Lake, 4-Burner Stainless Steel CharBroil, Outdoor Swings, 100 ft. of Flat, Sandy Lake Frontage, Pier with Sundeck, Table and Chairs; 4,000 lb. V-Hull Boat Lift Included, No Pets. 6 Bedrooms, 5 Bathrooms, Central Air and Ceiling Fans, Large Kitchen, Fully Enclosed Porch, Large Lower Level, Large Screen TV, Direct TV, Gas Grill, Good Parking, Basketball Hoop, 160 ft of Lake Frontage, Pier and Boat Lift. No Pets. 5 Bedrooms, 3-1/2 Bathrooms, Central Air, Wall of windows with Beautiful Lakeviews, Timber-framed Great Room with 35 ft high ceiling, Woodburning Fireplace, Large Family Room with Ping Pong Table, Kitchenette and Fireplace, Main and Upper level Decks: Covered Deck and Sunny Deck with Furniture, Charcoal Grill, Portable Firepit, Children's Playhouse, 145 ft of Shoreline, 2 Kayaks, 3 Bikes upon request, Large Pier, V-Hull Boat Lift, No Pets. 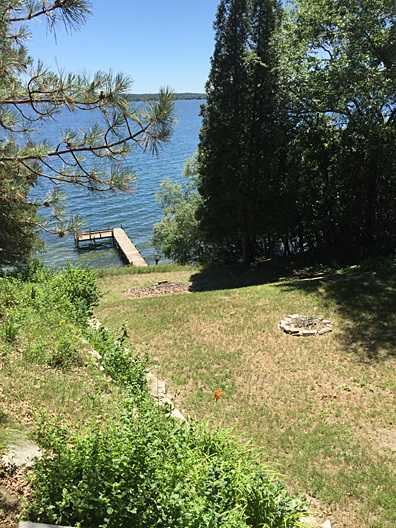 Lower Level of a Gorgeous Lake Home, 3 Bedrooms with Lake Views, 2 Bathrooms, Central Air, Rec Room, Wi-Fi Access, Charcoal Grill, 2 Patios with Furniture, Lakeside Firepit, Canoe, 143-ft of Flat Yard and Lake Frontage with Sandy Bottom, Large Pier with 2 Gliders and Umbrellas, Swim Raft, 6000 lb V-Hull Hydraulic Boat Lift ($250 charge), Second Pier with 2 Jetski Lifts ($85 each). 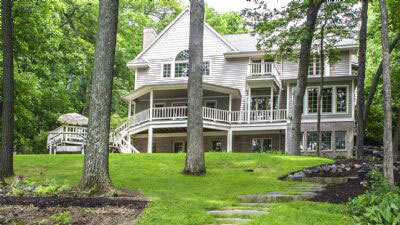 Vacation in the Lower Level of this gorgeous lake home. 3 Bedrooms, 2-1/2 Bathrooms, Kitchen has New Stainless Steel Appliances and New Cabinets and Granite Countertops, Great Room has Floor to Ceiling Windows with Panoramic Lakeview and Walk-out to Fully Furnished Patio, Fireplace, Ceiling Fan, Central Air, Charcoal Grill, Large Family Room with Walk-out to Screened Porch, Game Area in Basement with Foosball table and Family games, Firepit with 6 Chairs, New Deck/Patio, 80 ft. of Level Lakefront, New Pier with 5 ft Walkway, 12 ft Bench, 2 Chairs & Table, Shallow Swimming Conditions: 4 - 5 feet deep at end of Pier, Pontoon Lift at no charge (Must reserve in advance), 1 Acre Rear Lot for Outdoor Play, Dogs Negotiable with refundable $150 cleaning charge. Newly purchased home has been remodeled and updated including new furnishings: 3 Bedrooms, 2 Bathrooms, Central Air, Large Window Faces Lake, Fireplace, Large Deck with Furniture, FirePit, Gas Grill, Large Yard, Panoramic Lake Views from Pier on Blackbird Point, 145+ ft of Lake Frontage, Private Pebble Beach, Pier, 5,200 lb. V-Hull Boat Lift Included, One Dog Negotiable w/$150 Charge. 3 Bedrooms, 2 Full Bathrooms, Central Air, Ceiling Fans, Gas Fireplace, Walk-Out Balcony Overlooking Dartford Bay, Panoramic Water Views, Boat Slips, Boat & Watersport Rentals at Marina Below; Swimming, Restaurants, Shops within Walking Distance, No Pets. 5 Bedrooms (All New Beds), 3 Bathrooms, 2-Way Fireplace, Central Air, Ceiling Fans and Flat Screen TVs in All Bedrooms, Cable and Internet Access, Screened Porch Facing Lake, Flat to Water and Pier, Patio with Gas Grill, Pebble Lake Bottom, Electric V-Hull Lift, Electric Pontoon Lift, Firepit with Seating, No Pets. 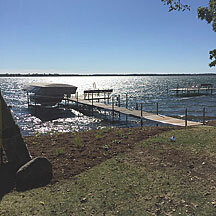 4 Bedrooms, 4-1/2 Bathrooms, Central Air, Free-Standing Fireplace, 4-Season Porch Facing Lake, Large Fenced-In Yard, Basketball Hoop, Gas Firepit on Patio Facing Lake, Screened-In Porch, Long Deck with Maximum Lakeviews, Pier, Marina within Walking Distance, Pets Negotiable. 3 Bedrooms, 2-1/2 Bathrooms, Newly Remodeled, Central Air, Fireplace, Wireless Internet, Ceiling Fans, Walkout Deck and Patio with Furniture, Charcoal Grill, Firepit, Covered Lakeside Deck, Pier, Shallow Water, 4 Kayaks available for Fun in the Shallow Waters, Pets Negotiable. 2 Bedrooms, 1 Bathroom with Shower, 3 Season Porch with Lakeview, Smart TVs with Cable, Window A/C, Fans in Every Room, Gas Grill, Deck with Furniture, Firepit with Lakeview, Sits Across Road from Lake with Public Access to Sandy Bottom Swimming, No Pets. 4 Bedrooms, 2 Bathrooms, Open Concept Kitchen, Dining and Living Room with walk-out to Deck, Central Air, Ceiling Fans, Screened Porch, Charcoal Grill, Deck across House facing Lake with Furniture, Pot Belly Stove, Pier with Boat Lift for V-Hull or 25ft Cobalt, Sandy Bottom Lake, Pets Negotiable. 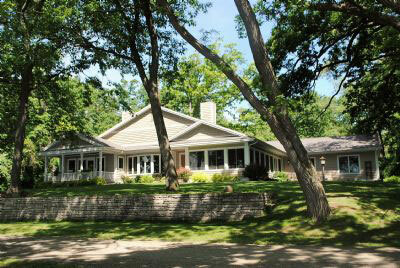 2 Bedroom Ranch on Lake Frontage, Handicap Ramp, Central Air, Whirlpool Tub, Charcoal Grill, Private Pier, 4000 lb. Boat Lift, Tent and Paddle Boat available to Rent, No Pets. 6 Bedrooms, 4-1/2 Baths, Modern Kitchen, Large Dining Room, Central Air, Large TV over Gas Fireplace, Whirlpool Tub, Wireless Internet, Game Room with Pool Table, Screened Porch with Grilling Station, Level Lake Frontage, Large Pier, 5000 lb V-Hull Boat lift (extra charge), No Pets. 4 Bedrooms, 2 Bathrooms, Rec Room, Pool Table, Large Flat-Screen TV, Wet Bar, Central Air, Gas Grill, Expansive Deck, Screened Porch, Lake Frontage, Great Swimming with Sandy Bottom, Extra Large Pier with 4000 lb Boat Lift, Firepit, Wireless Internet Access, Pets Negotiable. 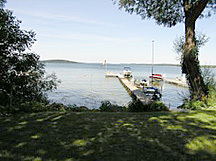 2 Bedrooms plus Sleeping Porch, Pier, Lake Frontage, Great Swimming with Sandy Bottom, No Pets. WEEKS STILL OPEN IN JUNE & AUGUST! 4 Bedrooms, 2 Bathrooms, Fireplace, Central air, 4 TVs with DVD players, Wireless Internet, 150-ft new pier with bench, Great swimming with sandy bottom, Otter Island swim raft, Large patio with furniture, 4000-lb V-hull Lift, 8000-lb Pontoon/V-Hull Lift, 1000-lb Jet ski Lift, 500-lb Lift for Canoe/Kayak/Rowboat, 2 Firepits (1 Fire-table with propane firepit & 4 chairs), 2 Charcoal Grills, Glider Swing, Good Parking on and off site, Dog Negotiable: $100 refundable cleaning charge; No Cats. 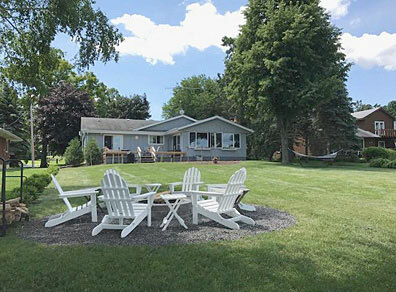 5 Bedrooms, 3 Baths, (Main House sleeps 8 and Guest House sleeps 4), Central Air, Wireless Internet, Sunroom, Charcoal Grill, Patio with Furniture, Flat Landscape to Water, Shallow and Sandy for Swimming, Large Pier, 4000-lb. Boat lift for $150, Swim Raft, Firepit, No Pets. 3 Bedrooms, 3 Baths, Jacuzzi in Master Bath, Central Air, Fireplace, Internet Access, Charcoal Grill, Picnic Table, 60 ft of Lake Frontage, 2 Car Garage Available, Pier, 4,000 lb. 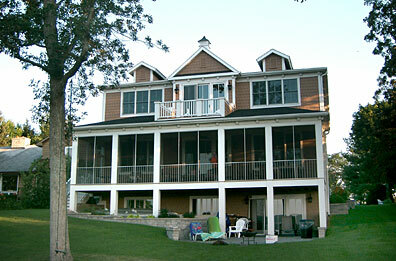 Boat Lift, Boat House with Patio on top, Good Swimming, Pets Allowed. 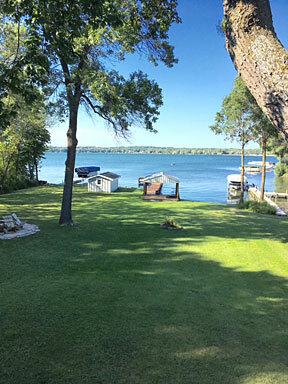 5 Bedrooms, 3 Baths, Central Air, Fireplace, 3-Season Porch with Lakeviews, Charcoal Grill, 135-ft of flat Lake Frontage, Pier with Pontoon Shore Station (can also accommodate V-Hull), Boathouse with Patio on Lakeshore, Firepit, Tram from top of hill down to House, No Pets. 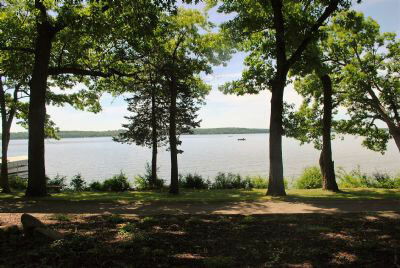 3 Bedrooms, 2 Full Baths and Powder Room, Central Air, Lake Room with 2nd Living Room and Large Dining Table, Internet Access, 12x16 Platform Pier, Swing, 50 ft of Lake Frontage, Walking Distance to Tuscumbia Golf Club and Heidel House Spa and Restaurants, Pets Negotiable with Pet Deposit. 7 Bedrooms, 6 Baths, Fireplace, Central Air, Internet Access, Large Private Dock, Boat Lift will hold 20-ft Inboard, Screened Eating Porch, Large Patio with Outdoor Furniture, No Pets. 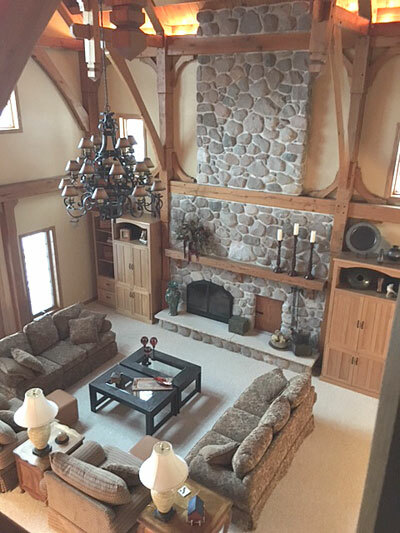 4 Bedrooms, 4 Full Baths, 2 Kitchens, Media - Game Room, 4,000 lb. Boat Lift, TVs, DVDs, Cable, Internet Access, Central Air, Gas Grill, Deck by the Lake on Norwegian Bay, In-ground Swimming Pool available for rentals of four or more consecutive weeks, Pets Negotiable. 4 Bedrooms, 2 Full Baths, Central Air, Fireplace, 3 Decks, Gentle slope to shoreline, Pier, Firepit, Shallow Lakeshore with Sandy Bottom for Good Swimming, Pets Negotiable. NEW for 2018: New Furniture, New Deck, New Painting, New Dock, New Landscaping! 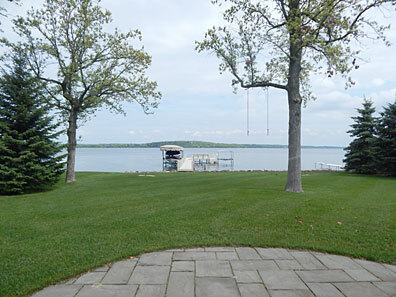 7 Bedrooms, 5 Baths, Great Room, Central Air, 2 Fireplaces, Outdoor Kitchen with Gas and Charcoal Grills, Large Deck, Large Wooded Lawn, 163 ft. of Lake Frontage, Pier, 4000 lb. V-Hull Boat Lift for $175 per week, Good Swimming, No Pets. 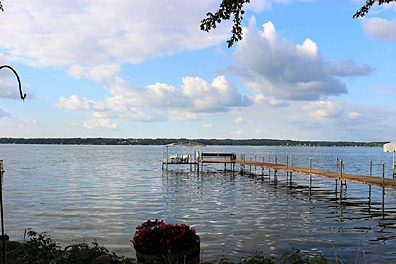 Spacious Newly Remodeled Lakehome, 7 Bedrooms, 5 Full Baths, 2 Powder Rooms, 2 Fully Furnished Kitchens, 2 Fully Furnished Living Rooms, Central Air, Internet Access, Large Deck, NEW 3-Season Porch, 4000 Lb. 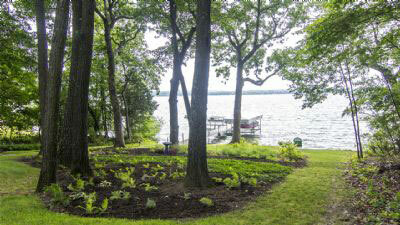 Boat Lift, Canoe, Pier, Firepit, Picnic Table, Beautiful Lake Views, No Pets. 5 Bedroom s, 4 Bathrooms, Fireplace, Lower Level Family Room with Kitchen and Walk-Out to Yard and Lake, Large Deck Faces Lake, Screened Porch with Furniture, Pier and 4000 lb. Pontoon Lift and V-Hull Lift, Dogs Negotiable with Pet Deposit. 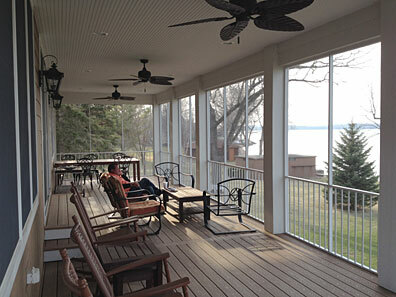 3 Bedrooms, 2-3/4 Baths plus Powder-room, Central Air, 100-ft of Lakeshore with pier, 4000-lb. Boat Lift, 1500-lb PWC Lift holds 2 PWCs, Jacuzzi, Fireplace (wood provided), Shoreline Sandbox, Bicycles, Ping Pong, Porch swing, Amenity-Packed! 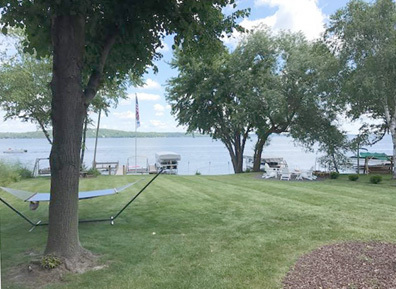 Lakefront Home, 5 Bedroom, 3-1/2 Baths, Fireplace, Cable and Internet Access, Wrap-Around Screened Porch, Pier, Boat Lift for 18 ft. Boat, Large Wooded Lot, No Pets. 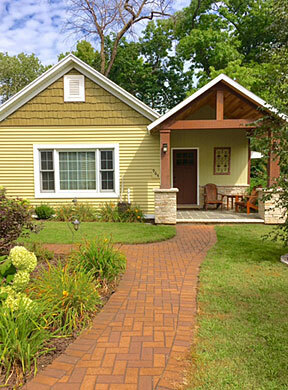 Restored Lake Cottage, 1 Bedroom, 1 Bathroom, Window A/C, Ceiling Fans, New Flooring, New Screens, Detached Screened Porch by Lake with Furniture, Pier, 2800 lb. Boat Lift, Good Swimming with Sandy Bottom, Pets Allowed. 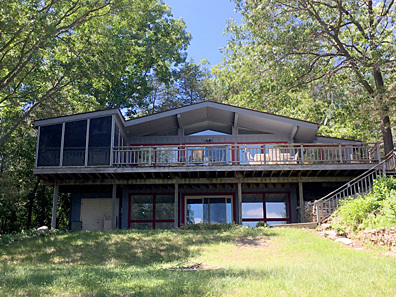 3 Bedrooms and Loft with Trundle, 2 Full Bathrooms, Central Air, Charcoal Grill, Panoramic Views of Green Lake, Firepit, 105 ft. of Level Frontage on Western Shore of Lake, Shallow Sandy Bottom, 150 ft. Fiberglass Pier, No Pets. 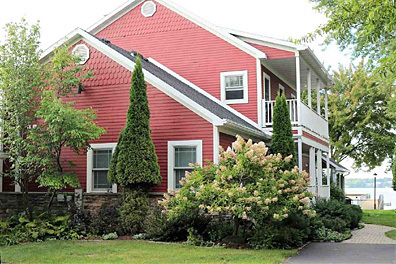 Can be rented with 46a Shamrock Sands-Main House to accommodate 12-13. 2 Bedrooms, 1 Bath, Wall A/C, Charcoal Grill, Lawn Furniture, Private Pier, 105 ft of Sandy Beach, No Pets. Typographic Errors and Omissions Disclaimer: Every effort has been made to display accurate rental details and rate information to-date. Sunrise Property Management hereby disclaims any responsibility for typographic errors or omissions in this web site's content. to help travelers check freeway conditions. These images are updated every three minutes. in making efficient transportation choices. Peterson's Happiness Acres Pet Resort. "A Retreat For Your Pet While You're On Vacation"
A web site sponsored by Green Lake's Chamber of Commerce. A must-see for anyone planning a visit to Green Lake. 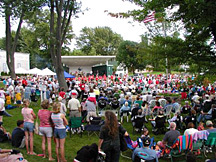 Calendar of events, photo gallery, activities, business listings and more, more more! 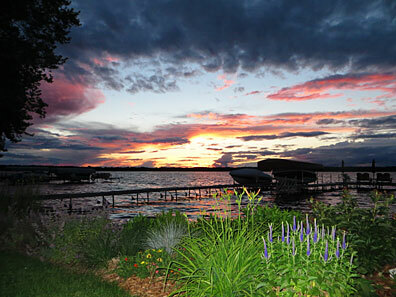 If you're interested in Green Lake, bookmark this site. The Thrasher Opera House, located in beautiful downtown Green Lake, is an outstanding musical, cultural and educational venue, in a fully restored historic building. Its masterful restoration and splendid acoustics have drawn rave reviews from artists and guests alike. This site will provide you with a calendar of events and on-line ticket ordering. Dennis Walker's Guide Service - Expert charter fishing on Green Lake. This site provides latest fishing news. 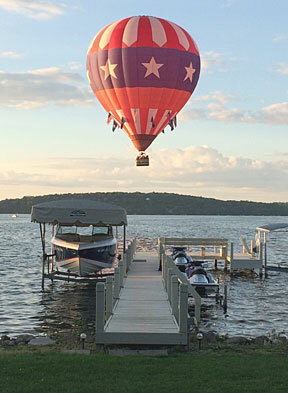 Wisconsin's Majestic Balloons - Enjoy a scenic sunset hot air balloon flight over the beautiful Green Lake County area. Sunset flights are scheduled daily from mid-May through early September and on weekends year-round. The world's premier aviation event and EAA's yearly membership convention, with an annual attendance of more than 700,000 along with 10,000 airplanes. Always informative and beautifully designed, EAA's web site is entertaining and packed with information about this famous Oshkosh air show. Schedules, activities, photos, etc.